The building stands for, amongst other things, an invitation to participate and embrace the VW philosophy. By definition, a pavilion is a light, airy and open building used for viewing of sporting activities. The concept of the building was therefore to create a facility to encourage viewing and participation, with all required amenities. Thus the building speaks of integrity, and is inviting and open to all VWSA employees and their families. The approved overall budget for the project required that as Principal Agents we were responsible to ensure that the building was designed, built and finished with respect to all the furniture and fittings so that it could function on completion precisely as the initial brief requested. The requirement for the multi-purpose sports hall led to very detailed discussions and meetings with the indoor cricket suppliers to enable the first movable indoor cricket system. The facility had to provide for a combination of indoor and outdoor sports with retractable equipment, so that different sporting codes could be accommodated within a single space, and also with minimal effort to change codes daily. A flexible space is created within a shed-like structure, housing the sports hall which allows for indoor cricket and soccer; outdoors provision is made for a netball court, soccer, rugby field and cricket pitch. The pavilion, in contrast to the solidity and mass of the sports hall, is a light, open structure providing views out to the sports fields and surroundings with its floor-to-ceiling glass panels. The two buildings, mass and light, are stitched together by the interstitial spaces in between, and by the spatial layering from inside to outside. Overhangs are provided, supported on slanted columns, which allow for pause, interaction and consideration of the surrounding activities in a dynamic environment. The building is intended to be a transparent, dynamic backdrop to the outdoor activities, with visual connection from inside to the outside, and from the outside in. The project's success is defined by the use and flexibility of the spaces in both the sports hall and pavilion building. The hall functions for all VWSA’s corporate events, main VW presentations and VW staff private functions. Breakaway areas are converted and used for various clubs and mini additional conference areas to compliment the working plant nearby. The proximity of the site to the main plant has ensured that accessibility for staff both during and after working hours is very convenient. 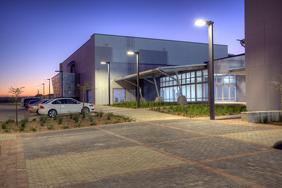 The biokinetic treatment centre in the gym area with state-of-the-art equipment has enhanced the life of the employees working at VWSA. At a distance, the transparent nature of the pavilion building makes the activities within the centre visible, thus beckoning an invitation to passers-by to participate in the activities within and around the centre. The pavilion project speaks of a balance between the solid sculptural form and lighter, airier structure expressed above. While the functional aspects of a sport facility is successfully adhered to, the dynamic nature of a typical pavilion building is not compromised. The complex comprise in essence two separate buildings - a sports hall and pavilion placed proximate to each other – each respectively serving either indoor or outdoor sports functions. Sensitive placement and orientation between the buildings ensure a matrix of solid and open spaces with clear through-views to all the activities. The physical covered linkage between the two buildings might have achieved a more integrated resolution. The project is clearly a refined architectural response resulting from good interaction with a discerning client. It is deemed a fitting recipient of a regional Award for Architecture.